The first one-time-pad encrypted email service that’s as easy to use as Gmail, and lets you keep your existing email address. It’s secure against any individual, corporate or government intrusion. It’s as easy to use as Gmail, Yahoo, Outlook or any other email service. You can keep using any email address you want. You can use it from any location on just about any device you want. You can send and receive to and from any email address you want. Integrated SPAM and junk mail filters. We don’t scan your open messages, or sell your meta data when you show it - and we give you a way to hide it. Over the years, encrypted communications have primarily been the concern of the military, government agencies and businesses like online retailers, banks, insurers and healthcare facilities. But things have changed, and now 7 out of 10 Americans believe the privacy of their online communications is being violated by hackers, corporations and government agencies. Until now, there has been nothing available that’s simple to use, genuinely secure and transparent to the point that a non-technical user can actually understand how their messages are being protected. As a result, most of us have either avoided the subject of security or settled for the easiest thing we could find and hoped it would work. First - Make it so simple that our users don’t do anything differently than what they’d do if they were using Gmail, Yahoo, Outlook or any other email service. Imagine you go to Gmail, Yahoo or Outlook on your computer, tablet or smartphone to compose a message. You select one or more recipients from a list of contacts that pop up as you start typing. You attach any files you want to send and you put a short description in the subject field. You write your message and format it however you like, with bolded, underlined or italicized fonts, colors, highlights, indents, bullets, numbers, whatever. So far nothing is different, right? All that’s left is to click the “Send” button. With Privus, the only difference is you have two buttons to choose from – one that sends your message in the open and one that sends it encrypted. That’s it! Simple to use doesn’t mean simplistic. Our interface is rich with additional features. You can assign priorities, save drafts, review and edit encrypted messages, and much more. But sending a 100% secure message from any desktop, laptop or mobile device through Privus really is that simple. Receiving an email is just as simple. In fact, you don’t do anything different. Just select a message from your inbox and it opens. All your private messages are transmitted and stored fully encrypted. When you click to open one, our software decrypts it on your local device and displays it for you exactly as it was originally formatted. When you’re done with it, you can disposition it however you like – reply, reply all, forward, label, package, move, trash, print, etc. And you can do it all with the added option of applying bulletproof encryption. With Privus, you can send to and receive from any email address – and you can use any email address you want, from any location or device. It is not an exaggeration when we say that the One-Time Pad (OTP) protocol has never been cracked. While no encryption method can withstand having its “secret code” (Cryptographers call this the “key”) exposed to the public, we can honestly say that with the OTP protocol, as long as you keep your key secured, no individual or organization will be able to decrypt your messages regardless of the resources they have available to them. With Privus, you can either use OTP to encrypt directly or you can use it to augment and enhance other encryption protocols, such as the AES (Advanced Encryption Standard) and RSA (Rivest Shamir Adleman) algorithms. We realize that it might be difficult to understand how a cipher that was first invented in 1917 can stand up against the resources of huge, high-tech government agencies. So if you’d like to learn more about what makes OTP encryption so unique, go the FAQ: “What makes OTP uncrackable?”. There really isn’t one. The only thing you’ll need to do is download a small application. It can be stored on any USB drive, your computer’s hard drive, your smartphone, an SD card or any other storage device you choose. Once the application is loaded, you can send and receive emails like you always have – but now, with absolute security. Regardless where you store it, our application provides a cipher-key (or C-Key) management system that makes everything easy. We’ve created pledge options for every budget. You can use your own storage device or you can get one of our USB drives with the application pre-loaded. There are significant technical differences between the solution we offer and what’s currently available in the “consumer” market. Other encrypted messaging services that offer simplicity, often provide it at the expense of security. The encrypted messaging services currently being offered have three problems: Weak Transfer Encryption, Decryption Key Storage and Key Abstraction. There are services out there that boast about double and triple encryption. They publicize their use of AES, RSA and SHA (Secure Hash Algorithm) protocols, but if you look at their implementation, they’ve left weak links in their chain of security. For example, some of the more popular services only use higher-level encryption protocols after your email, instant message or text is on their server. They rely on nothing more than standard SSL (Secure Socket Layer) or TLS (Transport Layer Security) encryption to transfer your messages to and from their servers. While SSL and TLS do offer a level of security, in the world of encryption, this would be considered a minimalist approach. This type of implementation is understandable. It requires little or no programming and delegates the responsibility of key management to your web browser – a web browser that was likely written by one of the same companies that have been handing over your information to third parties. 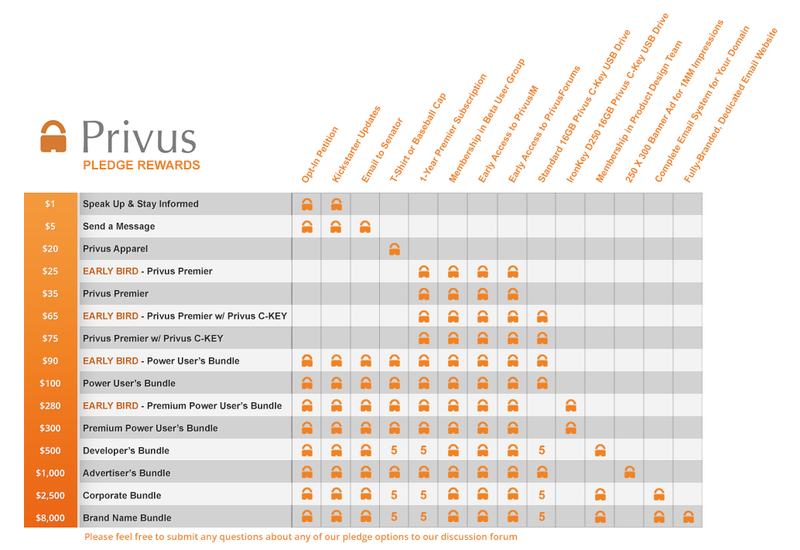 With Privus, your message is encrypted with either OTP, AES, RSA or a combination of all three before it’s wrapped in an additional SSL or TLS layer. And all this encryption is done on your local device without exposing any part of your message to the internet and without requiring any processing from you. To make matters worse, in the name of convenience, other messaging services store your decryption key (that’s the key no one should have access to except you) on their servers. So they’ve essentially left a Post-It note on the vault door with the combination written on it. Now granted, they tell you their vault is in a room that’s locked up, but once again, this translates into a heavy chain with a weak link. It doesn’t matter how strong the vault is, if it and its combination is in a room with nothing but a $10 padlock on the door. With Privus, your decryption key is never transmitted, and it's never stored anywhere except on a device you keep in your possession. This means your digital security can be translated into physical security. In the digital world, “walls” are absolute. You can’t drill through a digital wall. You have to find a gateway though the wall that exists and unlock it – and that means you need a key. If you keep that key (and any copies of it) secure, the gateway is secure. Privus provides a decentralized solution to secured communications that's simple to use but doesn't compromise on the security it provides. Decentralization is important because it means you don’t need to trust your security to someone else – not internet service providers, not wireless networks, not email services, not SSL certificate issuers, not websites, not even us. You alone control your security. The problem has been that the decentralized solutions that are currently available, not only transfer control to you, they also transfer the technical complexity to you as well. This is where Privus shines. We’ve transferred the control of your security to you, but all the technical complexity is managed by an application that resides on your system and works through a user interface you’re already comfortable with. You primarily send and receive encrypted messages on your work machine. You don’t want to leave your keys on an unattended machine over nights or weekends, so you store the Privus app on a USB device and keep it with you at all times. This also allows you to access your encrypted messages from any device that has internet access and a USB port. You do everything on a laptop, which already holds other secured information. You keep your laptop secure, so you choose to store the Privus app on your laptop’s hard drive. You like to access your emails from several devices, but you don’t want to carry around an extra USB drive. Your smartphone is always with you, so you choose to store the Privus app on your smartphone and use it as a storage device that connects to all your other devices. Beside secrecy, there are two things, that make a key secure: randomness and size. Randomness means there is no meaning, logic or pattern to the key. This prevents an attacker from being able to guess what your key is. You may think the name of the guy or gal you secretly had a crush on in high school is safe, because you never told anyone. But even a rookie hacker knows that people often use names for passwords. Running a trial-and-error attack on a few hundred thousand names can be done in a few minutes to several hours, depending on the equipment used. Random keys force an attacker to go from a trial-and-error type attack to a “Brute Force attack”. A brute force attack is when an attacker attempts every possible combination of characters. This increases the number of potential keys by orders of magnitude. For example, there are about a million English names in common use, but with all the keys on a standard QWERTY keyboard, there are 6.2 million to the power of 79 possible combinations that are 8 characters or less. This helps illustrate the importance of key length. While 86 digits is an extremely large number, it’s still within the capabilities of what some computers can analyze within a reasonable length of time. For that reason, modern keys are much longer than just 8 characters. In fact, most are between 256 and 2,048 characters long. This makes the number of possible combinations so large that even if all the computers on the planet were working on it, it would take over a million years to calculate only a minute fraction of all the possible combinations. In short – large, random keys make brute force attacks useless. Many encrypted messaging applications use large, random keys. But until now, managing large random keys has been problematic. You can’t remember them. So that means you need to store them somewhere and then retrieve them when you need them. As we explained earlier, most of the existing services save your keys on their servers, but you only use a simple password to retrieve them. This makes the randomness and length of your key completely meaningless, because the key can be accessed with a short, simple password. This is called “Key Abstraction”. In computer science, abstraction is taking the details of complex data or functions and reducing them to a simpler representation or process. We understand why other companies use abstraction – it’s easy. They can advertise that they use “big keys”. And they can advertise how they have convenient passwords. They just don’t advertise how one negates the other. With Privus there is no abstraction. Your login is completely separate from your encryption. Even if a hacker gets past your login, with Privus all they'll see is encrypted messages like the one shown below. The Privus C-Key is why we say you can now have a key to secure your communications the same way you have a key to secure your house or your car. As we mentioned, you can use your hard drive or on-board SD-card as your C-Key, and simply safeguard your device, or you can use any USB, SD or other storage device you choose. But if you really want the maximum security and the ultimate convenience, nothing beats the “Privus/IronKey” solution. We’ve partnered with IronKey to provide a solution that’s as sound as anything you’ll find in the largest corporations or government agencies. Not only does our use of a C-Key provide you with both security and convenience, but with Privus, you’re able to translate your digital security into physical security – and nothing does that better than Privus with IronKey. Privus provides a way to keep all your communications totally secure without having to jump through a bunch of tedious or technical hoops – no mouse mapping, no data dumps, no cutting and pasting keys or content, no multiple applications to install, no VPN networks, etc. And while we’re able to provide you with absolute security, our interface is actually simpler to use than many of the existing solutions that provide little if any real security. Rick Molina is the Founder and President of CypherCom, Inc. He fills the role of the Chief Operations Officer for Privus. Rick has a B.S. in Computer Science and has worked in software development for over 20 years. The majority of that time was spent as a business analyst and project manager creating functionality for web-based and desktop applications. His experience ranges from consulting startups to working for a Fortune-100 company as a program manager on a $38M government project developing software for the Department of Defense. Ryan Healey fills the role of the Chief Technical Officer. Ryan has a B.A. in Information Systems and Technology and has worked as a software engineer, database architect and development manager for over 12 years. Ryan has managed international software development teams ranging in size from 3 to 12 members on over 200 different product builds and has handled every aspect of software development, quality assurance and product deployment. Todd Cronin wears the hat of our cyber-security and encryption subject matter expert. In May of this year, Todd will be graduating with his Bachelors of Science degree in Computer Engineering. His academic focus has been on systems security. Upon his graduation, Todd will be commissioned as a Lieutenant in the U.S. Air Force, and will be on the front line of protecting our country’s digital infrastructure as a cyber-security analyst. All the best Todd! Kurtis Constantine handles marketing and community management. Kurtis served 10 years in the US Air Force Office of Special Investigations where he was recognized for his work in cyber-security and counterintelligence. The chart below gives you a convenient summary of what’s included in each pledge option. First, we’d like to sincerely thank you for taking the time to look at our project! And while we’d certainly like to invite you to help us bootstrap the final few steps to our launch, we’d also like to ask you to help us get the word out to all your friends, family members and associates. The more people there are using tools like Privus, the fewer intrusive resources there are available that can be brought to bear on any particular individual or group. In this game, when we help ourselves, we’re also helping each other collectively. The underlying technology is well proven with a track record that spans over 35 years. The only new variable is how our interface displays on all the different browsers currently being used on desktop, laptop and mobile devices. All the major functionality has been unit and regression tested and appears to be ready for beta. But as new features are introduced there’s always the possibility of finding new problems. All newly released, web-based software applications face compatibility challenges. Even Fortune-100 companies don’t have big enough budgets to completely eliminate any post-release bugs. The main risk to you, as one of our supporters, is that for the first few weeks, you might have to deal with the kinds of minor bugs that are sometimes found on less mature software applications. We’re inviting all of our Kickstarter supporters that have opted to sign-up for at least a one-year subscription to be in our beta user’s group. When it comes to testing software, the more people you have pounding on it, the better. With your help, we’re confident that we’ll not only be able to quickly find and fix any lingering bugs, but we’ll also be able to implement any enhancements you request. SPEAK UP & STAY INFORMED - As a backer, you’ll receive exclusive updates on Privus upgrades and releases. You'll also be helping preserve your right to privacy. SEND A MESSAGE - Reinforce your position on the public’s right to privacy by not only adding your name to a petition against the government’s monitoring of our communications, but also by having our email system send a letter (which you can edit) directly to your senator on your behalf. PRIVUS APPAREL - Help spread the word about our right to privacy. Get your choice of either a T-Shirt or Baseball Cap with the Privus logo and tag line. There is a $9.00 shipping fee for orders shipped within the U.S. – Sorry, no foreign shipments. EARLY BIRD SPECIAL*** $10 off the $35 pledge. PRIVUS PREMIER - Receive a 1-year Premier subscription to Privus and become a charter member of our beta user's group. You’ll be able to use all our encryption features on any email address you want, get unlimited storage and no advertisements. You'll also get early beta access to PrivusIM (encrypted instant messaging) and PrivusForums (encrypted forums). EARLY BIRD SPECIAL*** $10 off the $75 pledge. PRIVUS PREMIER W/ PRIVUS C-KEY - Receive a 1-year Premier subscription to Privus and our "Privus C-Key" 16GB USB drive with our Cipher-Key management application preloaded. You’ll be able to use all our encryption features on any email address you want, get unlimited storage and no advertisements. You'll also get early beta access to PrivusIM (encrypted instant messaging) and PrivusForums (encrypted forums). EARLY BIRD SPECIAL *** $10 off the $100 pledge. POWER-USER’S BUNDLE - Combine the $5, $20, and $75 pledges and get everything you need to protect your privacy and make a statement about your rights. Have the option to be on the petition, get a letter sent to your senator, receive a Privus ball cap or T-Shirt (you can swap the cap or shirt for an extra year on your subscription), get a 1-year Premier subscription to Privus, receive the preloaded "Privus C-Key" USB drive, be a charter member of our user's group, and get early beta access to PrivusIM and PrivusForums. EARLY BIRD SPECIAL*** $20 off the $300 pledge. PREMIUM POWER-USER’S BUNDLE - Get everything in our POWER-USER’S BUNDLE, but upgrade from our standard “Privus C-Key” to the IronKey™ D250. This is the gold-standard USB drive used by military and intelligence agencies around the world. For complete details on the IronKey™ D250 refer to the section titled "The Privus C-Key". CORPORATE BUNDLE - Receive everything that comes with the $500 “Developer’s Bundle” and have the entire Privus suite implemented for your company’s or organization’s web domain. Use Privus to manage your organization’s communications securely or to generate income from outside customers. Either way, you’ll receive steep discounts on these accounts that will add to your bottom line in the form of savings or additional revenue. BRAND NAME BUNDLE - If having the entire Privus suite implemented for your company or organization (See the Corporate Bundle) still isn’t enough, you can have the entire Privus website re-skinned to seamlessly match your brand image and have it published to any web domain you choose.